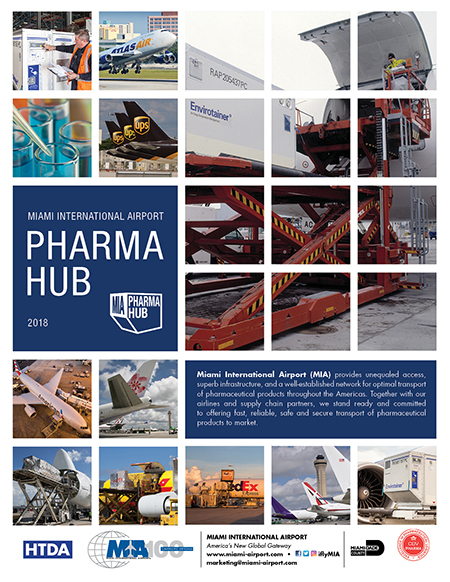 In 2015, MIA became the first airport in the U.S. and only the second in the world to be certified by the Geneva-based International Air Transport Association (IATA) as a pharmaceutical freight hub. This certification brands the airport to pharmaceutical manufacturers as a trusted industry leader that transports their products in accordance with global best practices. The designation also highlights MIA’s leadership as a safe and efficient logistics hub for these high-value, temperature-sensitive and often life-saving drugs and medicines. With MIA already ranked as the busiest airport in the country for international freight and perishable imports, its certification as a pharma hub is expected to significantly increase the $3.74 billion in pharma traffic it currently handles and position it among the top pharma markets across the U.S.